I am here to creatively portray your business & create meaningful relationships to help grow your customer base. Having worked in a restaurant for 4 years, I became passionate about the people, the food, the atmosphere and the dedication it takes to run a successful restaurant. I wanted more and I wanted to shine a light on the people and the food I was so invested in seeing flourish. When I run social media for a restaurant, none of the posts are automated, nothing is done without an honest care and passion for success. All photography is done by myself, and I work closely with the restaurant Chefs, Owners and Managers to hone in on the needs and the overall voice. Each restaurant is unique as is each photo we take for you. Now let's get to the good stuff. Provide outstanding and consistent visual content with strong brand awareness on all social media platforms. A consistent, attractive, up-to-date social media presence. Build stronger relationships with your current customers & community. Create, curate & manage all published content (visual & written) on your Instagram and Facebook account. We are not your standard "picture and post" social media company. We scheduled content shoots weekly and use only high quality dslr images. No iPhone photos allowed. Being that we are a small business, we handpick our social media clients. These are places we eat at, we love, we tell our friends about. We actually care how your business is doing and we want to help you be fully booked on a Tuesday night. Build your followers organically. No bots. These are real people, real customers following, commenting and liking your posts. Generate custom content. Everything we do for you, is customized to YOU. We take your voice and post copy just as you would. Our radar is always on. We respond to every message and DM for you. Click here to see our current projects and clients! 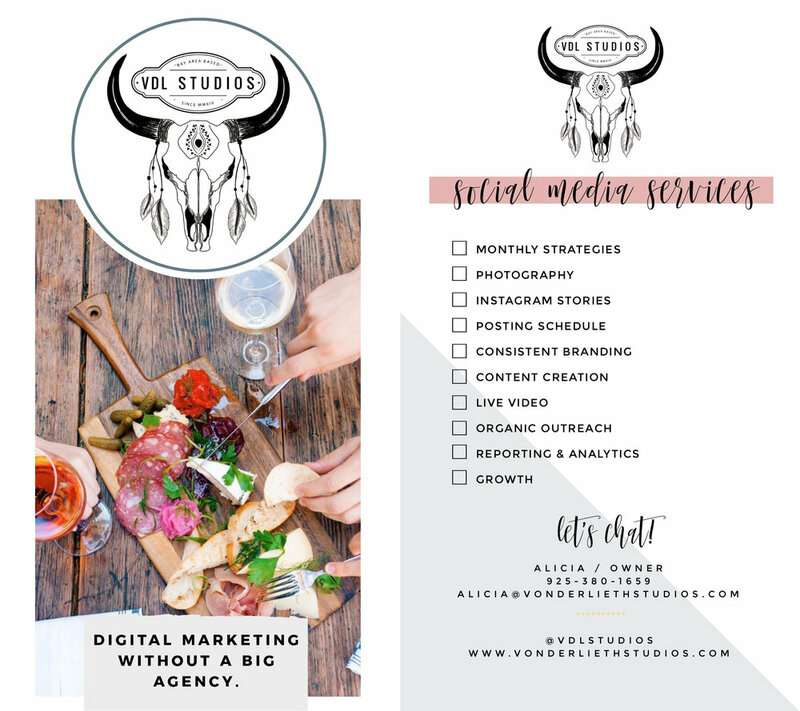 "I would highly recommend Alicia, from Von der Lieth Studios, for any and all social media and photography work, for restaurant related content. Have had the pleasure of working with her for over a year. During this time Alicia was always very professional and organized. She would send me emails or texts to check and see when I was available and check on upcoming special. She knows her away around the kitchen to get the best shots, and always new when was a good time to come in so she wasn’t in the middle of hectic restaurant services. I would always look forward to her clever Instagram posts and awesome shots of my food. Hope to do more business with Alicia in the future, wish her continued success." "Alicia has been doing our social media and photography for years now. She’s very dependable, creative and takes beautiful pictures of our food. I wouldn’t trust my social media to anyone else." Some EXAMPLES of a current clients social media.